Loyalty and integrity are in short supply these days. The world seems to be full of people that are ready to jump ship at the drop of a hat. That's not the Hufflepuff way! The world could use a little bit of the Hufflepuff integrity! You're a Hufflepuff, right? Maybe it's about time that you showed the world your colors! Yes, Hufflepuff students are known for their unending loyalty and their outstanding strength of character. While the Gryffindor are off engaging in dangerous (and often pointless) acts of heroics and the Slytherin are off cooking up some sort of sinister scheme, the Hufflepuff are making sure that integrity is upheld within Hogwarts! If you're a true Hufflepuff, then it's your sworn duty to show the world the Hufflepuff way and the best way to do that is with this licensed Harry Potter magnet. 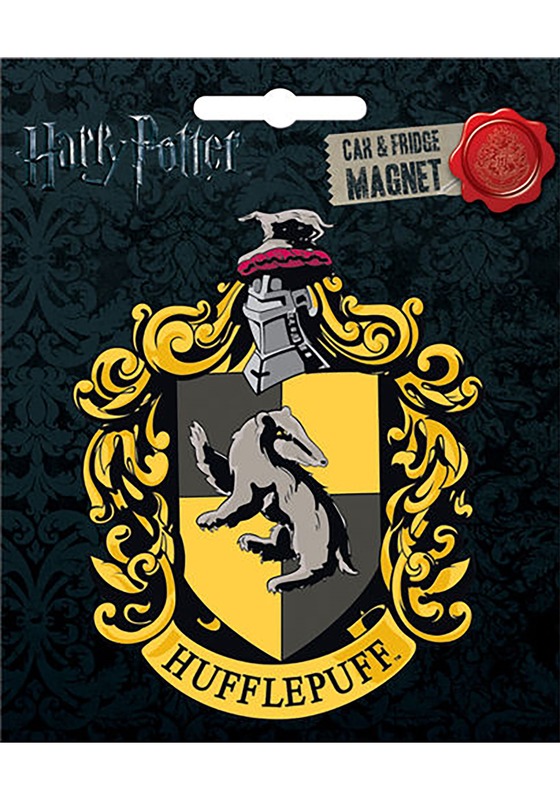 This Harry Potter Hufflepuff magnet comes with this Hogwarts House logo on the front. It has a magnetic back, so you can easily stick it on your car or your fridge. It's the easiest way to show your school spirit! Looking for a gift for the Harry Potter fan in your life? This Hufflepuff magnet is great for any fan!